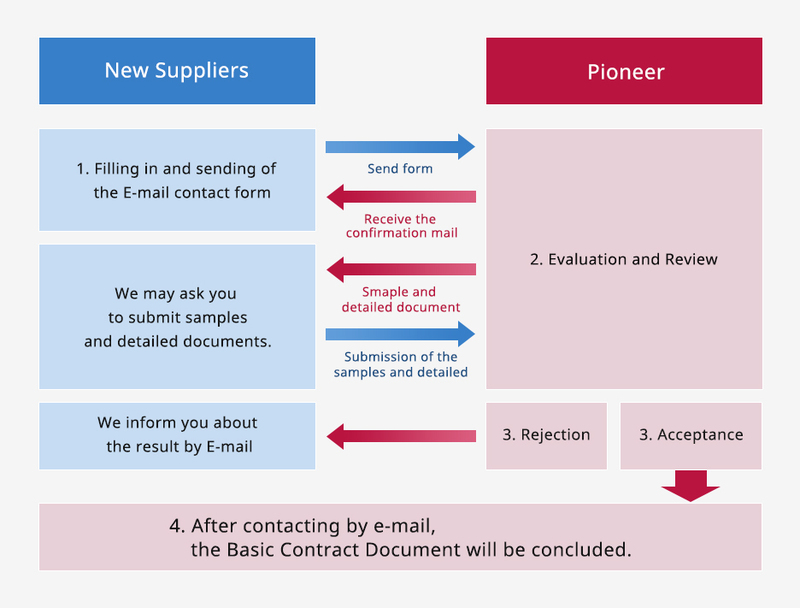 We, Pioneer, widely receive your proposals on parts and raw materials used in our products by the E-mail contact form. We do not receive proposals by phone. Only new suppliers can use this E-mail contact form. To consider the acceptance, we will ask you to provide samples, which will be tested by our engineering departments. The result will decide whether to conduct transaction of the components or not. Please note, however, that the provision of your samples does not necessarily guarantee the start of business. Since we consider that the possible benefits by the transaction should be shared by all the firms of the Pioneer Group, some of our domestic and international companies may desire direct dealings with you. In such cases we will separately deliberate with you about the contract, delivery destinations, etc. Pioneer collects your personal information through this web site for the following purpose in the Pioneer Group.